Smuggler Marine have recently delivered two tenders to a new-build yacht, while one of their Strata 630 tenders is now gracing the deck of a superyacht in the Viaduct Harbour. On the first yacht, a brand new Smuggler 700CC guest tender and Strata 540 RIB have been branded to match the newly-launched ketch. The Sumggler 700CC saw managing director, David Pringle, use the 700 hull mould while redesigning the transom to add a side entry door and create a centre console, open-style day boat. That side entry door allows guests to board the yacht safely and easily, with the topside fully-moulded foam protection fenders ensuring no damage to the yacht. A pull-out swim ladder is set beneath the large boarding platform while the spray dodger canopy cleverly hidden by the forward deck adds to the overall guest experience. This canopy is attached to a flush-mounted teak inlay recessed into the deck and easily assembled by the crew on wet, windy days. It’s able to carry ten guests plus crewmember, and is built to CE Category C standard for export. The matching crew tender was designed specifically to fit into the tenderwell of the yacht and is powered by a Volvo D3140 sterndrive. The matching colour schemes and teak work ensure the pair of tenders look present a cohesive front. 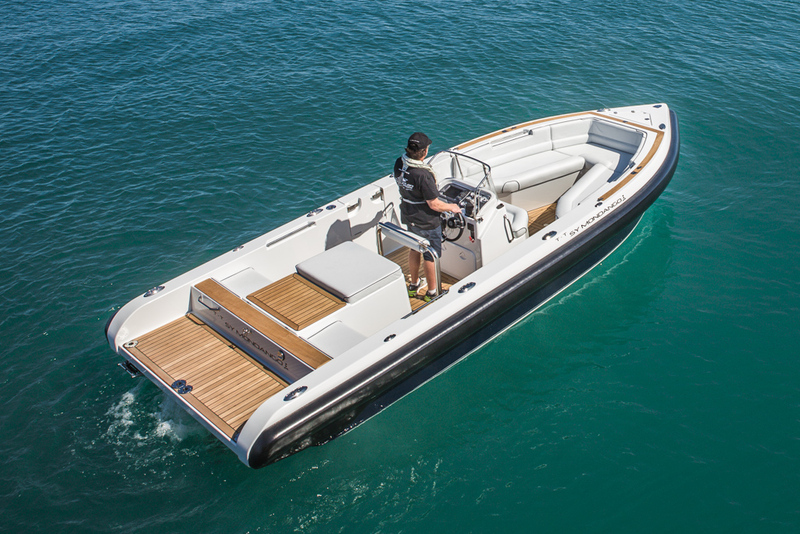 The Strata 540 tender is designed to carry crew and supplies, or for towing toys. It will take six people and is also built to CE standard. The Strata 630 tender chosen by a second superyacht visitor to Auckland has a fold-down forward ladder in response to the owner’s brief to include a set of forward steps to allow crew to disembark from the bow. The stairs were designed to fit the existing design, allowing a choice between the standard bow arrangement or the new fold-down stairs, allowing for ease of disembarkation onto the beach, as well as for swimming as the stairs can be lowered without water coming onboard.